A dish from the Mughlai cuisine where minced meatballs are made from a mixture of bengal gram, mango pulp and spices. Best served with rotis, rice, pulao or chapatis. 1. 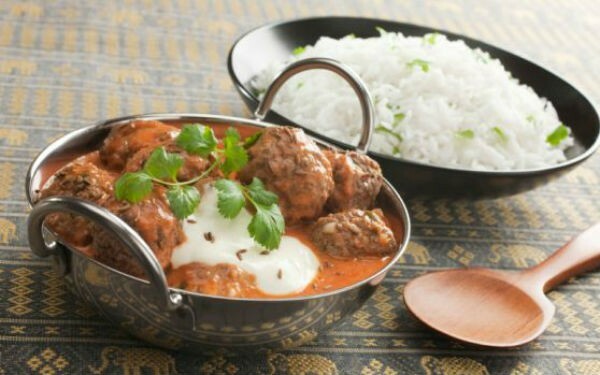 To make the koftas in a bowl, mix minced meat, 1/2 tsp chilli powder, shah jeera, salt and bengal gram power. Mix well and grind together. 2. Make lemon-sized balls out of the mixture and keep aside. 3. In another vessel, heat oil and saute onions till golden brown. 4. Lower the heat and add ginger garlic paste, the remaining chilli powder, turmeric powder and salt. 5. Fry together while adding a little water till the oil floats on top. 6. Add 4 to 5 cups of water. 7. When the water boils, add the koftas and cook until the gravy thickens slightly and oil floats on top. 8. Cool a little and then add the mango pulp. 9. Garnish with coriander and mango pieces. 10. Serve hot with chapatis. Feel free to comment or share your thoughts on this Aamras Ke Kofte Recipe from Awesome Cuisine.